For some people — not all — Halloween can cause mixed feelings because of its dark undertones. I recall many Halloween memories (and strategies). Forget the small candy containers—my brothers and I brought pillow cases. And if you went in town you’d hit more houses. But the homes out in the country were I lived gave more candy! And normal-sized bags of chips. But what are the origins of this weird night? 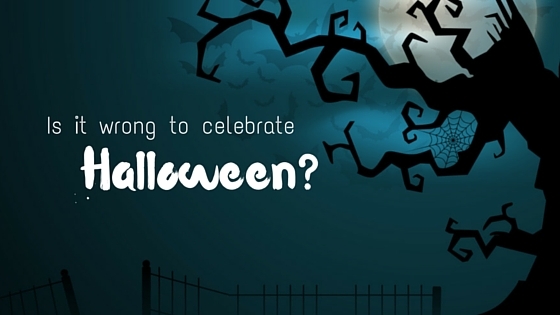 Should followers of Jesus celebrate Halloween? “First, some history: Halloween began in Ireland and Scotland around 2000 years ago – right around the time Jesus adult ministry began actually. On October 31 the ancient Irish and Scots celebrated the end of the summer and began preparing for winter. This day was also the ancient Celtic New Year – the day that was neither last year, nor the year to come – and a great day to play pranks! “The Celts also believed that on this, “in-between day,” spirits would wander the earth. So, logically, they dressed up in crazy outfits and made loud noises to confuse and scare them. Thanks for the background, Alex. Here’s my question: How does our example as followers of Jesus show our faith? How is Halloween a teaching tool? Some argue that the Christmas tree isn’t in the Bible, so why have one? Well, we’re kind of using it as a teaching tool, aren’t we? We have fun decorating it and put a star on top to remind us of the Star of Bethlehem over the manger (Matthew 2:7) or an angel announcing the birth of the Messiah to the shepherds (Luke 2:9). Some people shun it. I remember some from public school that did that. And then others go so over the top with ghoul that it makes you scratch your head. In fact, I’m putt off by the extreme nature of some of it. It’s almost an infatuation with death. I’m sure a psychologist somewhere would say it’s because the over-the-toppers are (deathly) afraid of death and Halloween is a thinly veiled attempt to normalize that which terrifies them. That’s a big one. When I speak to my own kids about fear, I always stress that they belong to Jesus. And when that is the case they really have nothing to fear. Ensure that kids (and yourself) know that ghosts and spirits have no power over God. But you have to be owned. Halloween can be fun—dressing up in costumes and going around for candy. It can be a chance to talk with neighbours and build a sense of community. And at the end of the night, you get some rocket candy as a reward. What we do (in private or in public) really speaks to our integrity. If we retreat from our faith when we’re with friends, or by ourselves, or on Halloween, it’s really an integrity issue. If you sense that you’re participating in something that clashes with your faith, you probably are. So this Halloween we’ll be having some fun at our house. The kids will dress up in costumes; we’ll all go door to door, say “trick or treat” and enjoy some tasty sweets. We’ll carve pumpkins, and use it all as a reminder that no matter how old or young we are, if we belong to Jesus there is nothing to fear. What am I going to dress up as for Halloween? My wife already got me an outfit. Apparently I’m going to be a cowboy! I’m sure you can look forward to some fun Facebook pictures. Or not! But if that doesn’t pan out, I’m sure I could look around and find something to make me look like Bob the Builder, a character from Mary Poppins, or Charles from Little House on the Prairie. Previous Post: How Does Your Faith Affect Your Vote? Hi Angela, I’m glad you liked it! Thanks Matthew. What I find interesting is that this wasn’t even an issue when I was a kid. I think it speaks to how much some voices in the Christian community (often originating in the US Biblebelt) have shaped Christian discourse. It doesn’t mean that they are necessarily wrong, but it is interesting. The other thing which is interesting is how much more macabre Hallowe’en has become. Hi Stuart, thanks for your words. I wonder if part of the issue is also that Christians are increasingly aware of how they stand out as Canada is increasingly non-Christian. Perhaps. And yes, the dark side of Halloween is a concern!